I bet you have a first aid kit in your bathroom cabinet. It is extremely handy to have bandages, tweezers and other necessary first aid items on hand in the event of an accident. Likewise, you'll need to have the same for your pet. Having the best dog first aid kit on hand is imperative, because items made for humans may not always be safe to use on your pet. A doggy first aid kit is something that you rarely need but when the emergency situation happens, you wish you would've prepared better. Ready.gov explains how being prepared is essential for pet owners not only to possibly save your dog's life, but also save on veterinary bills. There are many situations when the best dog first aid kit can be useful. Other than accidents at home, it can also come in handy while traveling, hiking or camping with your canine companion. If you already have your own first aid kit, you can add the missing items to make it a dog-friendly. But ASPCA Pro and other experts recommend that you keep a separate dog first aid kit specific to your pet because it’s safer, faster and more convenient. Just like little kids, dogs get themselves into trouble quite often. They get into things that they shouldn't and try to explore areas that may be harmful to them. Being prepared for emergencies is a big part of being a responsible pet owner, and American Red Cross explains and encourages all pet owners to familiarize themselves with pet first aid procedures and have at the least the very basic pet first aid kit at home and/or in a car. A pet first aid kit is similar to that designed for people – a collection of essential supplies and instructions that would allow you to assist your pet in case of accident. You can easily assemble your own dog first aid kit (here's how). However, purchasing a dog first aid kit that is already pre-assembled is significantly cheaper than buying all the first aid kit supplies separately. It's also a lot easier than tracking down the materials you need and ensuring you've got everything. Some pet first aid kits only have the necessities, while others include a lot of extras. It's up to you to evaluate each best dog first aid kit listed below to make sure it will be suitable for your dog. For example, if you frequently take your dog on hikes or other outdoor adventures, it may be wise to purchase one of the larger kits. We've ranked these pre-assembled kits below in order of cost-to-value. Most pet owners will not want to waste time looking for health supplies and instructions on how to use them when a dog cuts his paw or gets into something poisonous. The more extensive your best dog first aid kit is, the better. That way you'll have the peace of mind in knowing that you've got what you need in one convenient place, and understand at least the basics of dog first aid procedures. What is the Best Dog First Aid Kit? When you need to treat a pet for a wound or insect bite, you don’t want to scour the place for all the things you need. That’s why first aid kits are important – they make things simple and swift. The Canine Friendly Pet First Aid Kit is a handy fabric bag with a zipper that opens the whole side of the kit to allow full view and access to the supplies contained in each vinyl pocket. This kit contains a very helpful manual with simple instructions on how to respond to emergencies properly. Inside the kit are supplies that include a pair of scissors, a pair of tweezers, gauze rolls and gauze pads, elastic bandage, triangle bandage, exam gloves, tongue depressors, cold pack, emergency blanket, antiseptic wipes, and a few other items. The Canine Friendly Pet First Aid Kit is a good starting point for pet owners who always had the intention of coming up with a kit but never got around to actually doing it. Dog owners like the convenience of having all the small items in one place. They find the kit very useful even for humans. It has room for their dog’s medicine from the vet and even their own emergency stuff, too. It’s good to have one place for all health-related supplies – beats having to stash another bag which may contain similar items anyway. This is especially handy when going on trips with the four-legged travel buddy. For the price, this is one great buy. This Trail Dog Canine First Aid Kit is very comprehensive and portable. It’s carried in a canvas bag with a carrying handle. The back has a space for the vet’s emergency numbers and a sort of checklist of supplies you’ll find inside the kit in four categories – wound care, sprain, instructions, and medications. This is a 1.47-lb kit which you may easily bring wherever you go. In fact, it’s a good idea to always have one of these kits from Adventure Medical Kits in the car and another one in the house – you never know when and where you’ll need one. 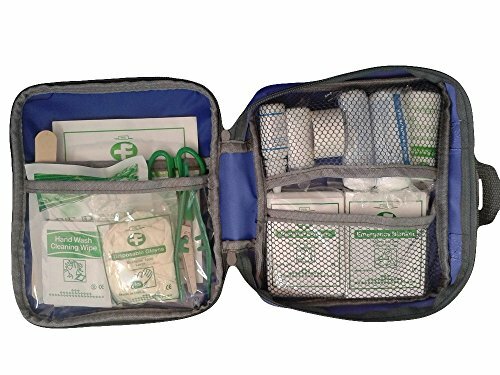 For wound care, the Adventure Medical Kits Trail Dog Canine First Aid Kit has bandages, gauze, sterile dressing, tape, wound wash, syringe, glove, antibiotic ointment, antiseptic, and alcohol. For sprain, it has triangular bandage, cold compress, and safety pins. Then it also has common medications, medical instructions, and instruments, such as EMT shears, tick remover forceps, emergency blanket, travel medicine guide and first aid manual, among other things. Best value for the money – this is what buyers think about this kit. It has the basic first aid things they need for a day trip or two, and just the right weight to add to the backpack. They’d want to find something more substantial though for much longer trips, but this is essentially what they’d bring along during weekend camping and usual walks to the woods or the beach. JoJo Modern Pet’s Essential Pet First Aid Kit is a square-shaped kit which you could easily insert between clothes inside a backpack or put inside a sling bag. It doesn’t occupy that much space, but packs a lot in it. The important thing that it does is keep the most basic first-response supplies in one small kit that you could bring anywhere because it’s so light and compact. The JoJo Modern Pets Essential Pet First Aid Kit contains 16 items – a pair of scissors, a pair of tweezers, triangular bandage, gloves, tongue depressor, instant ice pack, depressing bandage, emergency blanket, elastic bandage, antiseptic wipes, cotton buds, sterile gauze, antibiotic ointment, styptic powder, medical tape, and sting relief pad. These supplies are what you’d commonly need for cuts and injuries requiring immediate attention while waiting to get your pet to the vet. The carrying case is nice and compact, and the mesh and vinyl compartments keep supplies in place but easy to find and access. It’s the perfect thing to carry when hiking with dogs since it won’t be too bulky. A pet owner wished it came with more of the antibiotic ointment. It does come with a little of everything, which is good for reminding which supplies are more needed – which to buy less of or more of when replenishing them. This is a variation of our first product from the American Kennel Club, which contains 100 items. However, this one contains only 46 pieces. Originally this had 50 items inside, but four items were recently removed. It has the same red rectangular carrying case as the 50-item kit, with clear pockets inside to keep supplies in full view and easy access. This will be just the right thing to bring during trips, camping, beach combing, or whatever activities you’re doing with your pet. To be safe, make it a mainstay inside your car so there’s no forgetting it when it’s most needed. This kit contains scissors, gloves, cotton swabs, gauze roll, instant cold compress, gauze dressing pads, self-adhesive wrap, emergency blanket, tweezers, magnifying glass, med applicator, pet waste bags, collapsible water bowl, and a few other items. The fabric bag is well-made with plastic compartments to organize the supplies with. There’s a plastic envelope that folds in the center to hold other items that you add to the kit. Due to concerns about hazardous materials (hazmat), four items were removed from the AKC Pet First Aid Modified Kit – alcohol, antiseptic, hand sanitizer and sting relief wipes. This best dog first aid kit looks like it contains almost everything you’d need when attending to a dog with a minor wound or has a slight limp. You could easily buy the four items removed and possibly add styptic powder or a thermometer. The first aid carrying case itself is a beauty and holds a lot of stuff. It’s something that you would like to contain everything but hope you’d never come to use. These last two products would beat the five others for their sheer small size – they’d slip inside the side pockets of your cargo pants with no effort at all. The Canine Friendly Pocket Pet First Aid Kit is a mere 4”x 6”x 2” size and looks more like a coin purse than anything else. It has a carabiner, which you may use for attaching to your dog’s leash or your belt loop or backpack. Nothing can be more perfect for daily walks. This Canine Friendly first aid kit contains a first aid guide, gloves, medical tape, gauze pads, bandage roll, antiseptic wipes, wound plaster, and elastic bandage. The case is made of bright orange fabric so it’s easy to spot in the midst of other things even with its tiny size. The Canine Friendly Pocket Pet First Aid Kit has a black round thing on its back. Looking closer, you’d see an X-shaped opening where you may stuff doggie bags so it’s just one pull when you need one. The tiny size of this kit is already a dead giveaway that it is not the same as the first aid kit you’d bring to a week long camping trip. Instead, it’s a neat way of packing antiseptic, some gauze pads, and first aid tape without actually rummaging through the medicine cabinet for those items every time you go out for a walk. Think of it as keeping your walks a bit more fun, worry-free, and safe. This last product is another American Kennel Club pet first aid kit, but this time it only has 20 items, and it comes as a travel bag with belt loop. It’s perfect when traveling. It’s something you could pull right out of your pocket or from your waist. Imagine traveling with your dog and something in his paw is bothering him. Your dog would be grateful if you checked his paw right away instead of digging inside your luggage to look for a first aid kit. In fact, he’d thank you for having the good sense of wearing your AKC Pet first Aid Kit where it’s within easy reach. This compact emergency kit has 20 first aid items including a pair of tweezers, emergency blanket, emergency whistle, waterproof ID card, collapsible water bowl, gloves, antiseptic, sting relief pads, alcohol cleansing pads, gauze pad, self-adhesive wrap, non-adherent sterile pad, and a safety guide. The travel bag of the AKC Pet Safety Kit measures 4”x5”x1.5”. Dog owners find this best dog first aid kit very useful. Teams that respond to dog emergencies even bought this for their members. They added some more supplies that they thought they’d need more of. They’ve used other brands of first aid kits at this price point, and they like this best. The carrying case is one of the best they’ve seen for the price. Accidents and emergencies do happen, especially with playful canines, and you’d want to be able to make a timely response when something like that happens. A first aid kit is a must-have for families who own pets. This large version of pet first aid kit from the American Kennel Club is one handy piece with a hundred items that a pet owner might need in emergency and even non-emergency situations. This is licensed and approved by the American Kennel Club for this purpose. The red case is made of fabric and has a handle. It measures 11.5”x9”x3” and has pockets and compartments. The AKC Large Pet First Aid Kit contains a tick removal tool, scissors, tweezers, magnifying glass, disposable styptic pencils, hand sanitizers, alcohol swabs, antiseptic pads, cotton swabs, tongue depressors, gloves, gauze, thermal blanket, and syringe among the 100 items. You may add your own items or tailor the contents to your pet’s specific needs. Pet owners were impressed with the quality and exhaustive list of the items it contained. It does lack some essentials, like an ear thermometer, but a quick trip to the drugstore solved that. There’s enough room inside the kit for their favorite brand of eye wash or topical medicine. Others ordered this just prior to a trip and they were so glad they had it with them. It had everything they needed for minor cuts and skin irritations that they rated this as topnotch for its usefulness.